When selecting vegetables to grow in my container garden the first thing I always consider is the color. While flavor and productivity should be the most important I can't help but to be drawn to the unusual, be it color or shape and texture, fruits and vegetables. That's how I came to grow Burpee Seeds' 'White Wonder' cucumber this year. In the 2011 seed catalog there was an offer for a free pack of these seeds with an order. 'Long White' and 'Albino' are synonyms for 'White Wonder' which Burpee introduced in 1893 after receiving the seeds from a customer in western New York. The color of 'White Wonder' is usually described as white to ivory, but it turns a little yellowish as the fruit matures. At maturity the fruit can be 6-8" long, and as you can see from the picture it is almost as big as my hand. It's a good heat producer that really took off when I planted it in one of my self-watering containers on the porch which gets full sun. The fruit of this particular cucumber was a little on the yellow side and seedy because I'd let it get a bit past maturity because I wanted to make sure I could save seeds from it. There's a correlation between the size and shape of the fruit and the number of seeds produced by pollination. 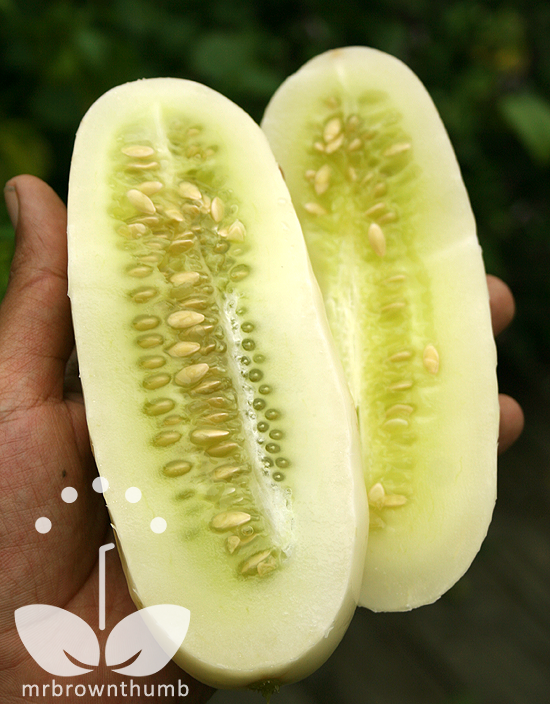 Each seed of a cucumber requires one or more grains of pollen to be formed. As you can see from the photo above I did a pretty good job of hand pollinating this cucumber bloom. Why has 'White Wonder' been around since being introduced by Burpee in 1893? Do gardeners grow it simply for the novelty of the white skin? While the coloring is a great conversation piece I would attribute its popularity to the taste and texture. Crisp, clean and crunchy is how I'd best describe it. This heirloom cucumber is suppose to be good for pickling and I wouldn't know about that because none have made it indoors without being sliced up either to be eaten or for their seeds. I should note for any vegetable gardeners who come across this and want to try it that the skin of 'White Wonder' can be a little tough when mature, you can avoid that by harvesting your cucumbers when they're younger. I like the sliced open version, but the whole thing looks a little freaky-deaky to me. Dunno why, since I like non-default veggie colors. Maybe it's the ghost of cucumbers past. @Monica, You're right. 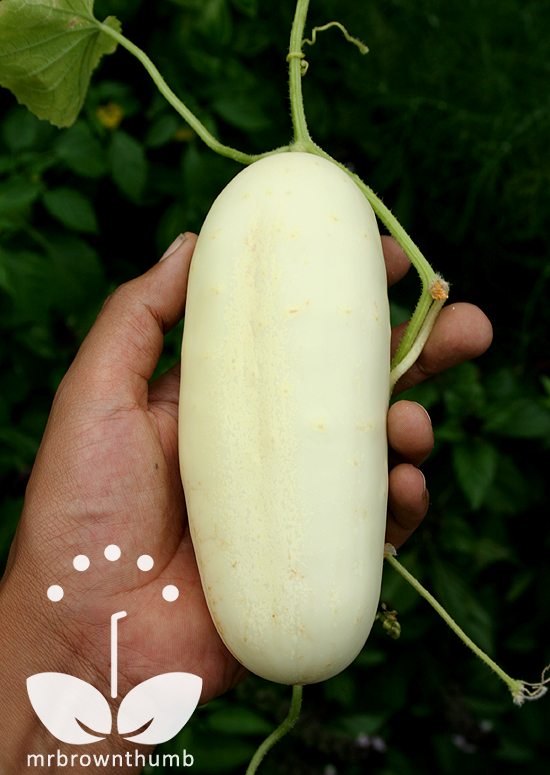 There is something kind of off about a white cucumber, but I can't put my finger on it. It's cool but unnatural at the same time. I am growing these for the first time this year too. They are good to eat. I've been picking mine at a much smaller size. The best thing is, they are easy to find in the vines! White wonder is easy to find and pick. They make great dill pickles! Try 'em and you will like this heirloom cuke.